Did Sean Penn really pee on The Tree of Life? You've probably read that Sean Penn, in an interview with Le Figaro, said this about working with Terrence Malick on "The Tree of Life": "I didn't at all find on the screen the emotion of the script, which is the most magnificent one that I've ever read. A clearer and more conventional narrative would have helped the film without, in my opinion, lessening its beauty and its impact. Frankly, I'm still trying to figure out what I'm doing there and what I was supposed to add in that context! What's more, Terry himself never managed to explain it to me clearly." Back in May, the great production designer Jack Fisk, who has known Malick for many years, told Dennis Lim in the New York Times: "I was shocked by how personal the story was when I first read it. But when I watched the film I just think how universal it is." Or, as Richard Brody, who writes "The Front Row" for The New Yorker, aptly quotes Fritz Lang in Godard's "Contempt": "In the script it is written, and on the screen it's pictures." Days of Heaven: "Somewhere, I don't know, over there..."
"Troops of nomads swept over the country at harvest time like a visitation of locusts, reckless young fellows, handsome, profane, licentious, given to drink, powerful but inconstant workmen, quarrelsome and difficult to manage at all times. They came in the season when work was plenty and wages high. They dressed well, in their own peculiar fashion, and made much of their freedom to come and go. "They told of the city, and sinister and poisonous jungles all cities seemed in their stories. They were scarred with battles. They came from the far-away and unknown, and passed on to the north, mysterious as the flight of locusts, leaving the people of Sun Prairie quite as ignorant of their real names and characters as upon the first day of their coming." 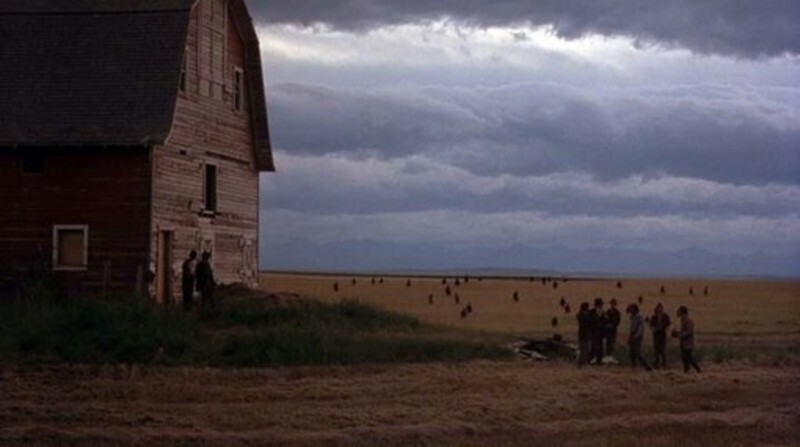 At some point in 1976, "Days of Heaven" was a screenplay that contained conventionally discrete scenes, developed exchanges of dialog and a fairly straightforward (melo-)dramatic narrative structure. Principal photography took place that year in the plains of Alberta, Canada (standing in for the Texas panhandle shortly before World War I), and the movie that emerged in 1978, after two years of editing, did away almost all of it. What the movie became -- as everyone couldn't help but notice at the time of its original release -- is a film in which the "background" (nature, the landscape) moves into the foreground and the human characters recede into macrocosmic expanses of earth and sky, and microcosmic observations of flora and fauna. And bugs.